Made of recycled fibers, add warmth to your yoga practice with our Thunderbird Supreme Mexican Yoga Blanket! 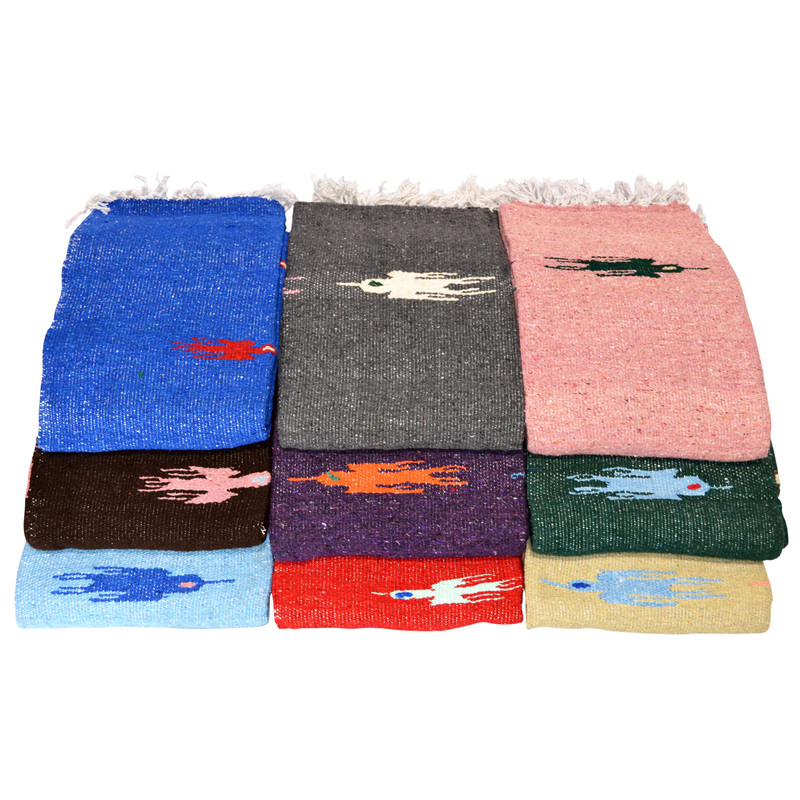 With birds varying in color combination on every individual blanket, these vegan blankets are soft, strong, and thicker than the average Mexican yoga blanket. Blankets make excellent and versatile props and also come in handy for keeping your body warm in Shavasana. Featuring tassels and thunderbird accents — representing the Native American spirit of lightning and thunder. You will love the rich colors, inspired by the American Southwest, woven right into this beautiful blanket. PLEASE NOTE: Tassle colors vary from whites, naturals, black, and grays. Colors of the birds on blankets can also vary in color. This blanket works just fine. It is as nice as my older Mexican Yoga blankets. I would happily buy another if I needed one. I have bought the Thunderbird blanket over many years now - my students love them too! Got these blanket in several colors and am very happy with all of them. They are thick and soft. My students love them! Love this blanket! Soft and washes up nicely. Thunderbird design is way cool. These blankets are great quality for the price. I was concerned they were a bit rough at first, but after one wash they feel great. Nice bright color and the thunder bird is a nice bit of detail. Service from yoga accessories was excellent. Delivery was very prompt and the deliver fee very reasonable. I ordered four green blankets and got three different colors. They aren''t really that soft, even after washing and they seem like regular Mexican blankets rather than the soft thunderbird blankets I am used to. Love these blankets. I ordered one last year for myself and my daughter, and bought another one this year. Great all around blanket, prop, or just to keep warm and they are pretty as well. I really love this blanket. I purchased it because I loved the design and the colors that were offered and when I received the blanket, I realized it was so much more than just a cool looking blanket. It is strong, durable, thick, soft, and everything you would ever want in a blanket. The name of this blanket doesn''t lie. It is the supreme. Strong, soft, and thick...it is a great blanket. This is now my favorite blanket. I love the color. I love the softness. I love the thunderbird. I love the thickness. I love everything about it.